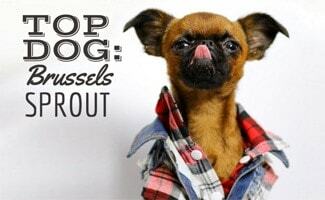 There are a few things that our team members at Canine Journal can agree on – we all love dogs and brussels sprouts. So when we came across a dog with the name of one of our favorite vegetables, we were drooling with excitement. Sprout is an adorable Brussels Griffon pup who struts the streets in his hometown of New York City in style (complete with his own custom apparel). When not agility training or modeling, “Sproutie” can be found helping raise awareness and raising money for dogs in need. 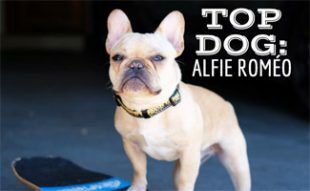 Read on to learn from his story, some funny advice and get some hot fashion tips in our latest Top Dog interview. How did you and your humans meet? My humans found me through a responsible breeder who they got to know for several months before flying down to meeting me and my littermates. As soon as I saw them, I knew they were mine. I pushed my way past my littermates and went right up to my mom and shoved my little pout in her face. The rest is history. How’d you get the name Sprout? My mom loves vegetable puns (oddly specific, I know) and I’m a Brussels Griffon so yeah. I’ve never tried a Brussel Sprout – it feels kind of cannibalistic to me! I do love carrots though. How did you get started with agility? I was a super shy puppy and going to school helped me gain confidence. After finishing all my puppy obedience and tricks classes, mom and I tried an agility class and both fell in love with the sport. Sometimes we have to get up early and drive a long way to train, but it’s totally worth it! Not to brag, but I know, like, a ton. I can do a handstand and twerk against the wall, which is pretty cool. 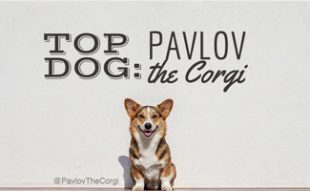 You can teach an old dog new tricks – just pick one that suits his natural behavior and personality! I naturally jump up on my hind legs (short guy problems), so learning how to “dance” on cue was really easy. Believe it or not, I like to do normal dog things! I could literally play fetch forever and I love going uptown to frolic in Central Park. I’m also a huge snuggle bug, so the rest of my time is pretty much spent sleeping, preferably in mom’s lap. We like to go to Dog & Co in NYC – they carry a lot of unique brands! Pet Haus is one of my favorites – they make my signature denim jackets. The key to shopping is making sure it not only looks good but feels good! Clothes are only cute if the dog wearing them is happy and confident! 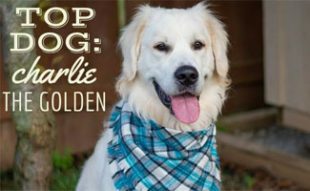 If your dog just isn’t into clothes, stick to bow ties and bandanas instead! What’s your favorite projects and why? For my first National Puppy Day, I got to hang out with Ralph Lauren and go on a coffee date with four dog supermodels (Toast, Ella Bean, Chloe and Mochi) which was pretty epic. This isn’t the Ralph Lauren National Puppy Day campaign that featured Brussels but is another ad by the fashion line starring some other furry and adorable canine fashionistas. 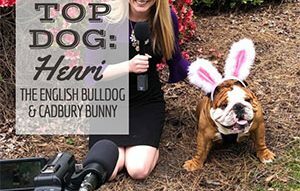 What do you love about being a celebrity pup? I love that it gives me a voice and an opportunity to help less fortunate pups. We are passionate about supporting shelters and putting an end to puppy mills. It’s important to help educate people so that they understand why buying a dog from a pet store or online (gasp!) is not OK and how they are actually perpetuating the vicious puppy mill cycle. Besides your BFF Pablo, who’s your favorite fellow celebrity pet? Well, I’m a teenage boy, so I crush a lot. I have the hots for @ellabeanthedog and @williecute has the prettiest hair ever, but @petitpennybg is my soulmate, and I’m gonna marry her someday. I get extra pouty when I’m tired. That’s all. Be sure to follow Sprout on Instagram @brussels.sprout and his website. Thanks Sprout for taking the time to interview with us and good luck snagging your future wife! Do you have any questions for Sprout? Leave them in the comments below. Too cute (and funny) going to follow you now Sprout!